Brenda Rua, the Rival Angels World Heavyweight Champion. 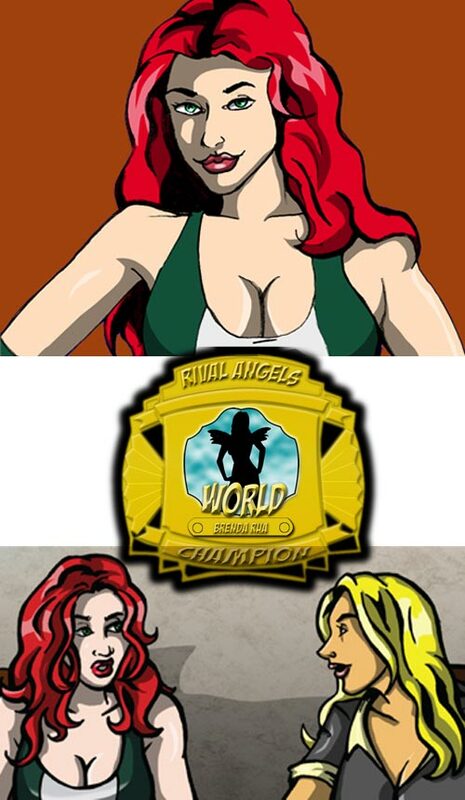 I thought that this would be a good time to put some focus on the title holders of Rival Angels. The World Champion since the beginning, she’s defeated the likes of Black Widow, Yvonne Carmichael, Victoria Buckingham and Chloe DeSade. The Celtic Warrior will be defending her title at the BAD BLOOD PPV in a 60-minute Iron Woman match against Yvonne Carmichael. (The PPV is tentatively scheduled for Chapter 14). April Black and Blue Danvers, the World Tag Team Champions, Black and Blue. This team is also a long time holder of their belts. April Black and Blue Danvers have been the best of a tough tag team division that has seen more focus with new teams entering the division like TOO HOTT and PREMIERE CHEER. Of course, the TOWERS OF TERROR with their manager Johann as well as the CATGIRLS are serious contenders. Katherine Smith of Hell’s Belles, the current TV Champion. The first TV champion, Kat Smith has regained the belt, not without a fair amount of controversy, after losing the belt to Xtina Carpenter. Kat originally won the title during the inaugural Television Championship Tournament. Because of the bottleneck at the World title level, everyone in the top ten is a serious contender for the title, including Xtina Carpenter, Victoria Buckingham, Krystin Moline, Nikki Foxx, Rampage, Sun Wong and Sabrina Mancini. why not include York Twins, and Brady Brandt and Vanessa Holiday? and who are the Premiere Cheer? Neveah? Seems like several girls in wrestling have that name. Mo Chen is a fan of Neveah Crist. She’s a member of Ohio is For Killas with her hubby and his brother. Anyways, always love seeing her at SHIMMER. 🙂 Her and Ashley were a fun team and their matches with each other after they broke up were great. As for Neveah as part of Premiere Cheer, all of their names are supposed to suggest heavenly or divinity and there is one more to their number we haven’t been exposed to but keeping with the theme. don;t forget there’s also the evil goatee look if brina doesn;t want to change her hair color. LOL, no, Brooke would’ve still been a heel with the cheerleader faction. She wouldv’e been their leader until she left them, or they left her. Brooke’s always going to be a ‘bad girl,’ despite her alignment and the thing is that when she’s fighting the likes of Perfection or Hell’s Belles, it’s hard NOT to be the face in those matchups. For Rua, I just hope RUA REMAINS CHAMPION AFTER YVONNE. Mostly because if the stipulation of both Sun & Sabrina are still ACTIVE within this new match of a tag team, Sabrina would remain in RAW & Sun becomes #1 contender to Rua… THUS SUN CAN BATTLE RUA FOR THE TITLE! SO BRENDA MUST REMAIN CHAMPION!!!!!!!!!!!! Brenda’s fans make me feel better about my choices in life. Callie, your choices will always loom over you. But just keep saying “One day at a time.” Even you can do anything, one day at a time. Yes, you can! (About time. I almost thought there were no champions in Rival Angels (at least until Sabrina gets in the picture)). The Celtic(?) Warrior will be defending losing her title at the BAD BLOOD PPV in a 60-minute Iron Woman match against Yvonne Carmichael. (The PPV is tentatively scheduled for Chapter 14). The first TV champion, Kat Smith has regained the belt, not without a fair amount of controversy, (all thanks to Sabrina Mancini) after losing the belt to Xtina Carpenter. Kat originally won the title during the inaugural Television Championship Tournament. Because of the bottleneck at the World title level, (read: glut of midcarders not “worthy” of facing the “champ” due to said “champ” holding them back) everyone in the top ten is a serious contender for the title, including Xtina Carpenter, Victoria Buckingham, Krystin Moline, Nikki Foxx, Rampage, Sun Wong and Sabrina Mancini. There is no way in HELL that Yvonne will become the New World Heavyweight Champion. I hope & pray for a Rua win so she can wrestle Sun once she & Sabrina in this tag match. JSN, you seriously need to update your smack. It’s got all the impact of a wet Ramen noodle. For starters, I suggest you change the channel away from the Bad Girls All Star Battle. Should have a “Jobber Queen” title so Monica Rumble can finally hold some gold. You know, I expect Yvonne to put up a hell of a fight this time. Sure I beat her fairly handily before. But she took me a little too lightly. She’s not going to make that mistake again. And she’s been working pretty hard from what I hear. Also there’s the matter of her friends. That’s definitely a complication. But I’m focused. I’m stronger than ever and been fine tuning my grappling. My cardio is tops. I can go 60 minutes if by some miracle she lasts that long. But no one seriously thinks this match will last that long. When two big, strong, skilled and determined women go after the same thing, it’s going to get brutal fast. That’s what the fans want and I guarantee they’ll get it. That’s my kind of fight, and you better believe I’m going to make her fight it. The only think you go 60 minutes at anymore is a buffet. And you seem to need a refresher on the concept of an Iron Woman match. I know what an iron woman match is. Deary. I have a pretty good recollection of schooling you in it. This match is 60 minutes. But if she doesn’t have the gas for it then I own her. I’ll break her body, then her will. The rest is history. So, you see the only refresher needed around here is an air freshener to get us through to your Saturday shower. I didn’t know you had the knack for remembering dreams so clearly. But as someone who’s had the misfortune of seeing you eat, I know you certainly do have the gas for it. Not sure how hard Yvonne’s been working lately, but you know Damage Inc will have a company presence.